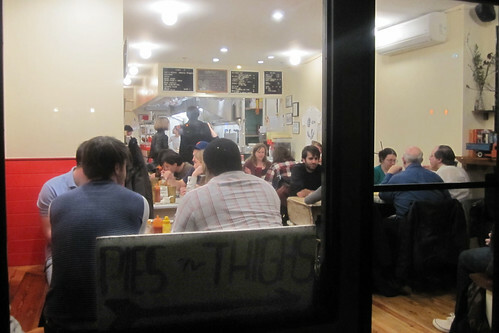 Long anticipated Pies N Thighs is finally opened after 2 years! 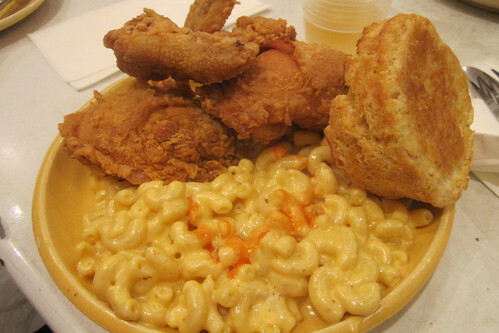 Theres no doubt they have the best fried chicken ever (no longer at Roberta's since Carolyn Bane opened PNT). On a Tuesday night, arriving at 8PM, expect to wait at least 40 minutes for a large party. The space holds at least 60, but there are constantly hungry customers lining up.But dont worry. Its worth it. 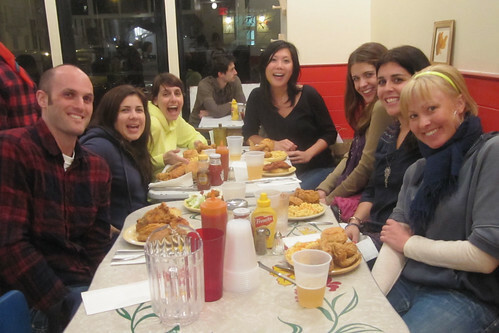 We came as a party of 7, and none of us wanted to share, so we all ordered the same thing: Chicken box with biscuit (uh, biscuit came out cold) and one side (everyone go the mac-n-cheese). Crispy skin, juicy meat. Pour some honey and hot sauce over it and you're in heaven. "I am a bloated and gassy beast right now." "Me too. I feel like Fudgie the Whale but it was worth it." "I ate my leftovers for breakfast and it was good!!!" Long live Pies N Thighs.